When spring has finally sprung, you’ll want to enjoy the sunshine and beautiful weather, not spend your time pulling weeds out of your garden. Here are a few easy things you can do to prevent weeds from ever becoming a problem, courtesy of The Farmer’s Almanac. Mow them down. Keep your lawn well-manicured; mowing regularly (particularly along your property’s edges) to help keep the weeds at bay and stop them from ever invading your garden. Mulch, mulch, mulch. The benefits of mulch cannot be overstated. It provides your plants with important nutrients and enhances garden design tremendously, but, perhaps most importantly, it can block sunlight from reaching the weed seedlings, thus stunting and preventing growth. Stay together. Try planting your seeds closer together than you normally would. The more spread out your plants are across your garden design, the more room you leave open for weeds to sneak in. Ready the guillotine! If weeds have already invaded your garden, one easy way to remove them without spending an entire morning is to just cut off their heads before they get a chance to flower. Have any other helpful tips for beating back weeds? Share them on our Facebook page! The stunningly showcased “Falling Garden” art installation aims to uproot ones traditional perception of botanical beauty and we just love the wonder it creates. By suspending various plant life from around the world, modern Swiss artists, Gerda Steiner and Jorg Lenzlinger, enable one to experience flora in a new way: from the ground, looking up. The viewer participates by lying on the floor and gazing above. There, surrounded by a floating sea of color and whimsy, the experience is meant to transport one into a state of peaceful tranquility. The installation of the piece in an Italian 17th-century mausoleum further adds to the spectacle. By juxtaposing the presence of death below the viewer with the abundant life and promise of renewal above, the exquisiteness and harmony of the suspended flowers is made much more significant. Overall, the mix of garden life with a unique historic backdrop creates a dreamlike vision. “Falling Garden” can be seen as inspirational in bringing vintage or antique repurposed tokens into your own garden. In doing so you can capture a whimsical feel that makes your garden a truly special place. You can increase the square footage of your home if you know where to look – simply open the door and there it is! The search for luxurious outdoor spaces is on the rise as plans for “staycations” increase due to the lagging economy and the need to de-stress. Whether it’s an antique bird bath, waterfall statue, steaming hot tub or sparkling pool, your own yard can be transformed into a relaxing retreat. The backyard of your dreams can become a reality with a few pieces of freshly refurbished wicker. Then, add side tables plus an outdoor rug and you’ve created a comfortable living area under the stars. Fashion an outdoor dining space as simple as a picnic table and grill, or as elaborate as an outdoor kitchen and stone fireplace. Perk up a front porch with vintage rockers, grandma’s braided rug and planters with lush greenery. Suddenly that long-abandoned porch becomes a comfy place to unwind. Need help imagining your outside oasis? Marvin Gardens is brimming with unique and vintage pieces to make your outdoor space “staycation” worthy. Outdoor living is perfected when you have just enough to make the space comfortable and inviting. The incredible thing about landscaping is that it can involve much more than flower arrangements and patios. With the right inspiration and the right tools, a property can become a vivid, architectural dream. Just take a look at the exemplary work of a client of ours, Richard Hartlage, who was one of the distinctive landscape architects behind the design of the Chihuly Garden & Glass Exhibition at Seattle Center. At the recent grand opening of the exhibition, guests were greeted with an exceptional entrance for the glass art. AHBL Landscape Architects worked for three years to complete the design and construction for a garden full of vibrant colors and plants. Scarlet daylilies, old-growth Wesern Cedar logs, Aster Prince, and a huge planting of handkerchief trees were just a few of the items used to construct the exhibition’s grand entrance. ... to it's completion, the Chihuly Garden and Glass exhibition is simply stunning. As we can tell from the garden images published online, the scene is absolutely stunning! Be sure to take a moment to browse through the incredible garden design and let us know what you think. Happy Memorial Day from Marvin Gardens! This time of the year is certainly something to be celebrated. With the warmer spring weather and exciting events around every corner, we trust that you’re enjoying the Memorial Day weekend and the spring season so far. As we celebrate Memorial Day, we thought we would take a look back at some of our most popular posts from the Marvin Gardens Blog. We enjoy using this method of communicating with our clients and friends, and we hope you do too. Simply click on the links below to see our most popular posts. Do you have a favorite? Leave a comment and let us know about it. We wish all of you a Happy Memorial Day! Though the organization in perfectly arranged rows of garden vegetables is endearing, there are many more options for vegetable gardening than you might imagine. One of our favorites is to bring in vertical interest by using an arbor or trellis. These structures have offered a sort of sanctuary-look for decades. They make a garden feel like a special destination or enclosed room, even when they’re dressed with simple vegetable plants rather than blooming flowers. These structures also make a lovely display for gardens that are tight on space, bringing the eye upward and taking advantage of new angles. So, what grows best on trellises? 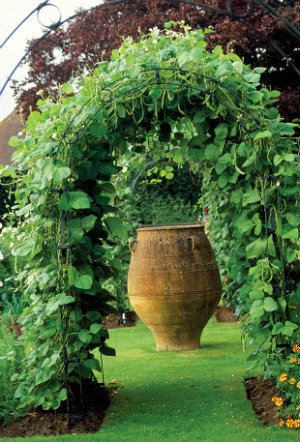 Consider using vining crops that have tendrils for clinging – peas and beans are perfect for this. Another idea for non-climbers such as squash, melons, or tomatoes is to coax them upward using twine. The process is simply incredible. A trellise begins as a beautiful visual anchor, then transforms with the growth of lush plants, and later becomes a beautiful harvest. 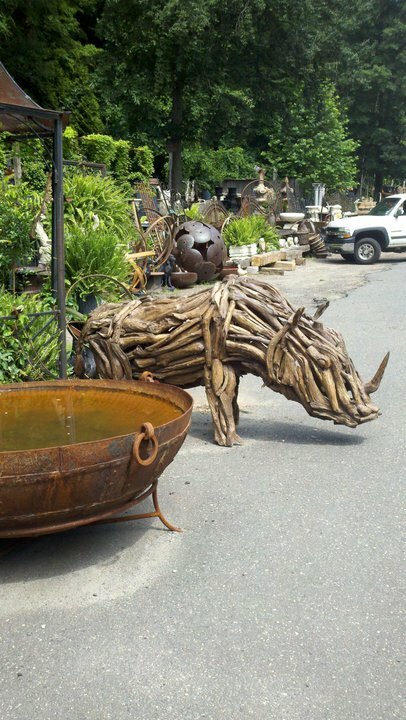 This teak driftwood rhino is a fabulous example of the specialty pieces you'll find at our shop! You guessed it – May is one of our favorite months of the year here at Marvin Gardens! 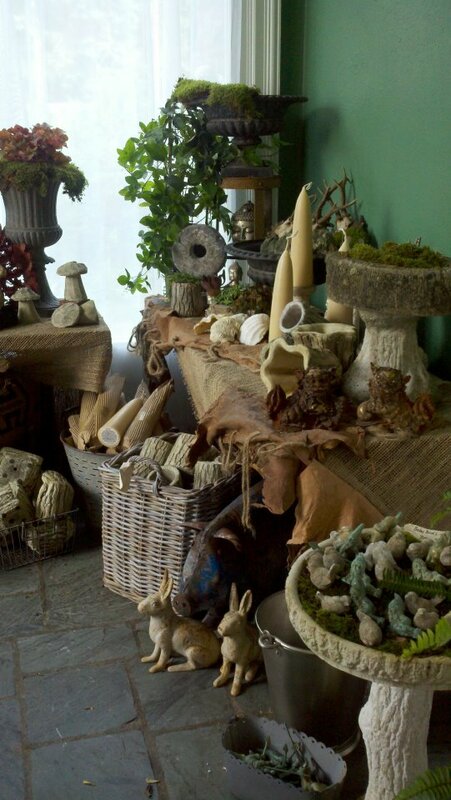 As our clients are getting their gardens primed and ready for spring blooms, we are busy making sure that our shop is stocked with one of a kind garden elements that complement those blooms like nothing else. We already shared with you how our selection of custom cast iron urns is second to none, but we also take the same approach to the entire inventory at our shop. To create a unique garden, you need unique garden décor, so we search high and low for these one of kind pieces. We’re also thrilled to custom design and custom make pieces to suit your garden perfectly. And since new pieces are arriving daily, every time you stop in for a visit you’ll find new inspiration. If you have an eye for outdoor style or you’d like to learn more about it, we invite you to experience Marvin Gardens this spring!